City of Wells Steam Train. Journeys on the 34092 City of Wells, marking the opening of the The North Yorkshire Moors Railway’s new season, are under way, with more trips along the scenic countryside line taking place thoughout the week. The NYMR confirmed recently that 60009 Union of South Africa, which was planned to be the guest engine for the opening event, would not be able to run along the 18-mile heritage line. This was due to the locomotive needing new piston rings and valve rings which could not be sourced in time for her visit. 34092 City of Wells was called in as a late replacement, much to the railway’s delight. Chris Price, General Manager at NYMR, said: “Working within the heritage preservation world, situations such as this bring home how fragile these historic locomotives are and the challenges associated with maintaining old equipment. 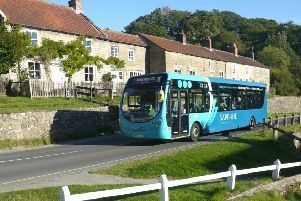 “Obviously, the charity is disappointed but we are confident that having 34092 City of Wells travelling across the moors will be a fantastic sight to see. “I would like to thank the East Lancashire Railway for their co-operation and support during this time. Any passengers who had booked on 60009 Union of South Africa services should arrive for their scheduled journey as planned. from Grosmont Station tomorrow (April 2), Wednesday April 3, Thursday April 4, Saturday April 6 and Sunday April 7. Tickets to travel behind the Bulleid Light Pacific locomotive are priced from just £30 for adults and £15 for children aged four to 15. 34092 was constructed at Brighton Works in 1949 and later that year it was named Wells which was changed to City of Wells in 1950. In 2017, agreement was reached between the owners and the East Lancashire Railway for the railway to buy the locomotive. Click here for more about the NYMR.